Further.. Nearer.. Now: Behind the scenes of Further. ‘F*ck this!’ became my second frequent phrase (after, ‘..it’s tea-time, right?’) during the 3-week Austria filming session for Jeremy Jones/TGR’s new film , Further back in February this year. Camping through constant -20C temperatures for a week was one of the toughest things I’ve ever done: tougher than last year’s Arctic nonsense, tougher than our Deeper AK expedition that primed this whole ballgame. It made me swear. A lot. And now after two flippin’ years in the making, it’s with us. Further premiered yesterday in Tahoe. 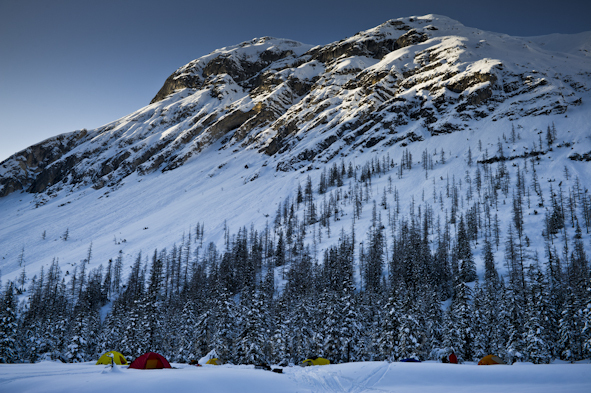 In 60-minutes, TGR have condensed two years of cold camping trips in places where sometimes you’d rather not be. 2 years of feeling remote, of hiking lines and getting shut down by the weather. 2 years of patience, frustration, debates, angst and laughter. 2 years of listening to American accents. 2 years of eating freeze dried meals and sh*tting in the snow. And 2 years of unique life experiences. Sub zero temperatures mess with the cheese. 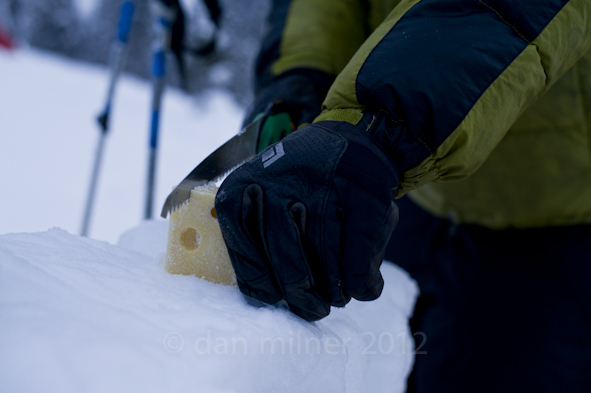 After only a couple of days and nights the only way of even getting near to cutting this block of cheese was to use a snow-saw. Our first week out in Austria this year was accompanied by the coldest persistent temperatures on record for over 50 years. Camp cold. This was as close as the sun got to hitting camp, meaning a 2-3 hour hike up to reach its warming rays and escape the real cold of the valley floor. It took us 5 hours to skin in and haul our gear to this camp zone. Nick the film tech guy hardly ever got to leave camp. I think his fingers are still there. Mitch digs the window. By contrast our second session in Austria used an unstaffed refuge. It was cosy once we were inside. 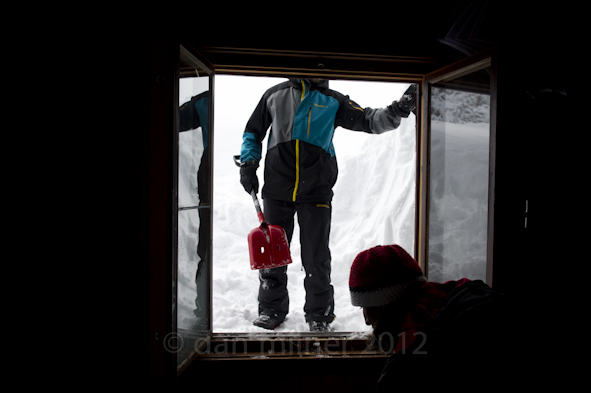 All we had to do was find it in the dark at 8pm amidst swirling snow remnants of a three day storm and dig it out. Here Klaus and Mitch excavate the window. This was our home for 4 days. Unlike the -20C camp session a week before, I would have been happy to stay here a lot longer. The Hut. The hut’s location sat it right between some big lines and some small mini-golf warm up runs. 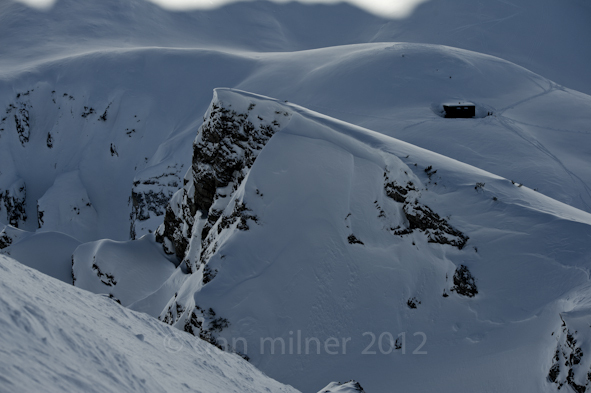 I wish we’d known about these gaping cliffs when we were probing about in the dark trying to find the hut, or maybe not. Topo map of fun. 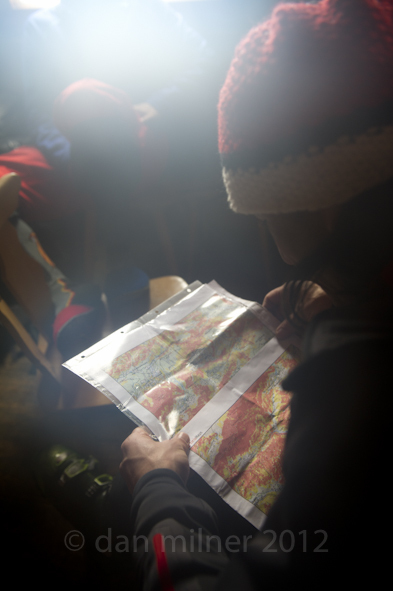 Klaus our guide studies a topo map of the area around the hut. Red colour indicates slope angle above 40 degrees if I remember rightly. Not a lot of room for error here. It is terrain that pushed our limits once the temps started warming up. Waiting, drying. 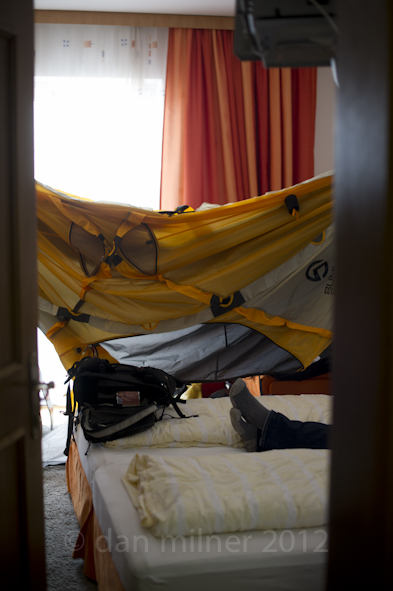 Being stormed out of the coldest valley in Europe meant having a hotel room for a couple of days to sit out the worst of the storm. It meant drying out tents and kit in any way we could. Red dawn. Projects with Jones always mean early starts: we’ve done it in AK, in Canada and in the Arctic, but it never gets easier. Clawing your way from a sleeping bag in a hut in the dark is no real hardship, but doing the same from a tent in -20C weather means digging deep inside. Every move as you struggle free releases a shower of frost from the tent fabric. Once you’re out and the sun is rising though, you know why you’re there. Like the ten-day blizzard that hit camp in Alaska as featured in the award-winning Deeper movie, again a storm pins down Jeremy Jones’ adventure team in basecamp, this time in Austria. And again I get to hold forth in another epic monologue. Things are looking bleak, but luckily, as you’ll see from this film clip, we have remained unaffected and unchanged by the fame that has been bestowed upon the film team by the award wins and unfathomable success of Deeper. The most useful attribute that 15 years of shooting snowboarding professionally has drummed into me is that of patience. Being patient with your riders and respecting the enormous effort they are putting in and the risks they are taking to get a picture forms the basis of a solid, healthy working relationship. Of course, if you’re out on an ice-field somewhere up near the North pole dealing with 24 hours of daylight and the eternal threat of polar bears, this kind of notion can slip from your everyday working practice. 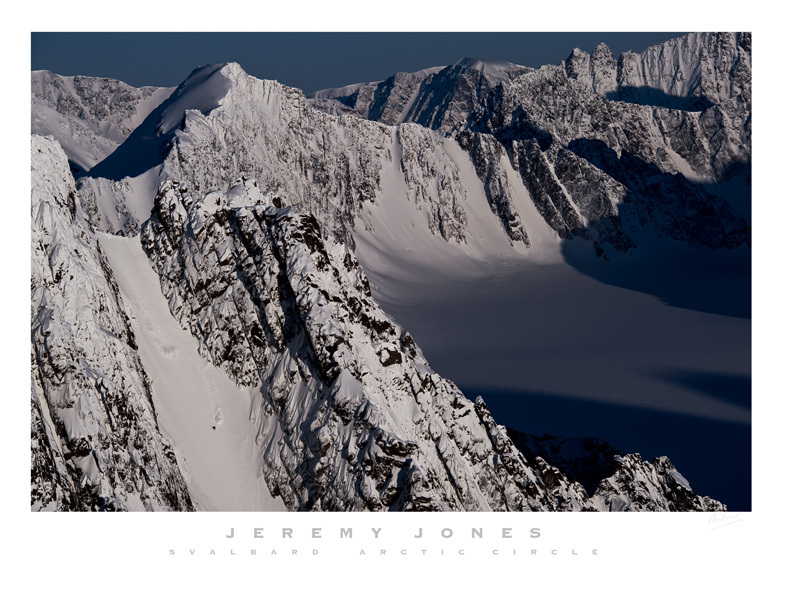 Here is episode 4 of my random set of behind-the-scenes look at our TGR Further Svalbard trip with Jeremy Jones and Terje Haakenson. Cold. So cold the oil lubricating the diaphragm blades in my 300/f4 lens started going sticky. That’s cold. I know. Shooting a sequence of Jeremy Jones riding a line that looked like human flypaper, every 3rd frame is underexposed by 3 stops. The aperture just wouldnt open up quick enough in succession to match for the 8 frames per second shutter. Sticky oil. Cold. I just spent 3 weeks in Austria shooting with Jeremy, Mitch Toelderer and Bibi Pekarek as part of the 2-year TGR Further film project. Our session saw us camping for 6 days straight through one of the coldest snaps Europe has had in 50 years. -23C day and night with no let up can be testing at times, and saw the very real of frost bite in temps that prevented the 4-season gas from burning in our stoves. It wasn’t all a grimace though, no, there were moments of levity. My how we laughed the morning when we discovered Chris had forgotten to unlace his damp snowboard boots the night before and now they had frozen so solid he nearly broke his ankle trying to get his foot inside. The mental picture of him hopping about screaming in pain as he tried to force a foot into the unrelenting boot will make me laugh for decades to come. And then there was the almost daily challenge of trying to hack slithers off the frozen cheese for sandwiches. We had to use a wood saw. Happy days. Human flypaper: Jones rides a nadge tech line that is usually reserved for summer climbers. We split 13 Km towing our gear on sledges to camp here. 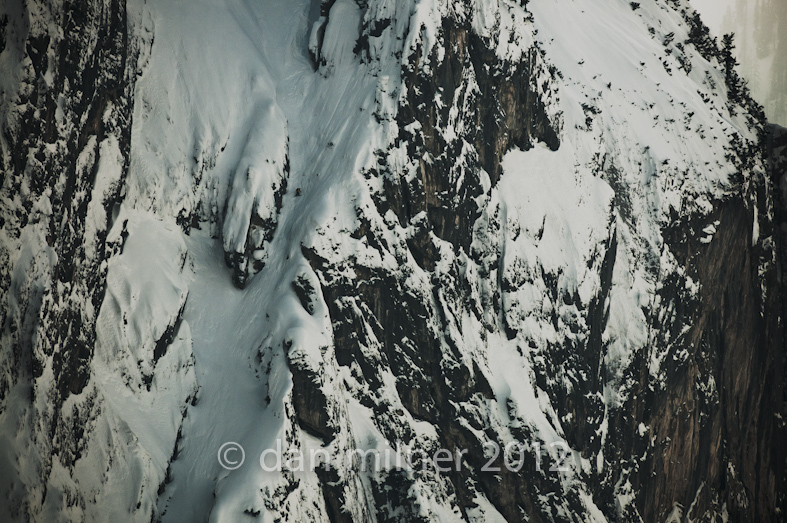 Nikon D3s, 300f4, f9, 1/640th. The snowcamp session and subsequent winter-hut session that followed drove home how tricky some of these “expeditions” can be, logistically, physically and mentally. Ironic that we were only 10 miles from an Austrian city of 100,000 people, and so much easier than our Svalbard arctic mission last April. So close, yet so far. Thats what it takes sometimes to get into mountains that offer faces that have never been skied/filmed. Willingness to get cold. The feature will grace a number of snow titles next winter. I may have even thawed out by the time they go to print. Holidays on ice: getting in there with TGR. Righto, on the eve of setting off on the Euro-installment of the Further movie project with Jeremy Jones, one that will see us snow-camping right slap bang in the middle of Europe’s coldest snap this year (hmm, I was shooting in a finger and battery crushing -27 C yesterday) I thought I’d give you another glimpse of the kind of challenges we robust adventurer types face (when we’re not being mollycoddled in luxury 4-start hotel spas), with an unplugged episode from TGR. So, if you’re growing tired of my incessant amateur video work (see tag ‘Mangina Chronicles’), you can marvel at what a full pro production team that knows how to film and edit properly can make of our Svalbard expedition. Here’s TGR’s recent behind the scenes take on the challenge of getting into ‘the zone’ for our Arctic camp-out in Svalbard. Click on the link below. Be prepared though: this video is no where near as good as my own Mangina episodes. The Svalbard chronicles episode 3: The door. Welcome to no. 3 in my random series of insights into the life of an adventuring photographer camping onthe polar island of Svalbard as part of the Further film project. This episode: There’s no satisfying some adventurers it seems when an inexplainable “number” arrives in camp. 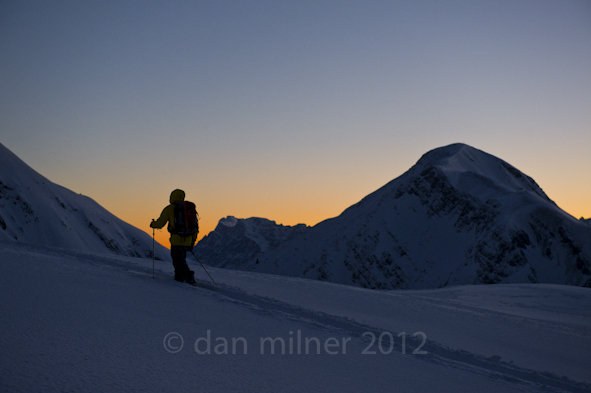 Svalbard chronicles episode 3: the door from danmilner on Vimeo. Another installment of my GoPro video behind the scenes glimpse of the life of an adventure photographer. Episode 2: Things begin to go awry among the TGR Further splitboard expedition crew, camping deep on the polar island of Svalbard, 700 miles from the North Pole. Well, what do you expect with seven blokes and only one rifle between them? The Svalbard Chronicles part 1: Downtime in camp. It’s that time of year when bike shoots get muscled out by the ripped torso of snow-bound adventures and the postie suffers relapsed hernias while trying to stuff my letter box with assorted snow mags from around the world that feature my work shot last winter. This week the latest Transworld Snowboarding dropped with a resounding thud onto my WELCOME door mat, well in fact 2 significant issues of TWS did -the 2011/12 Photo Annual and their 25th anniversary issue. 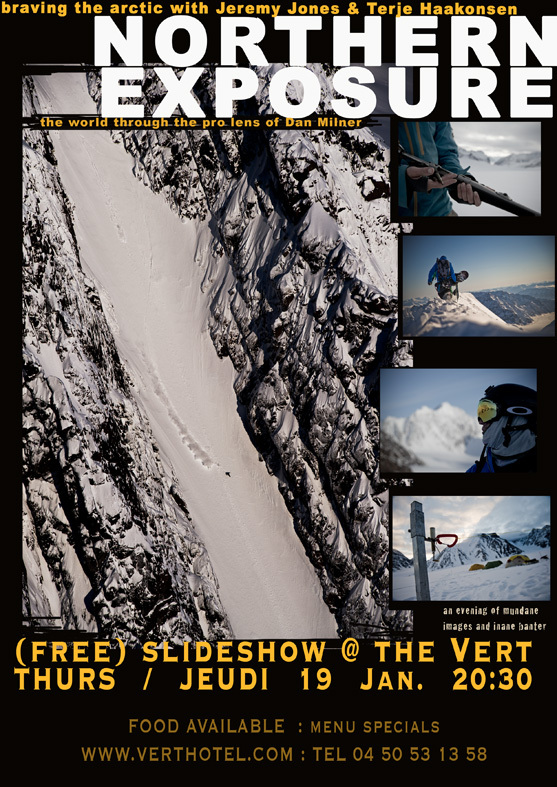 The former sports what TWS’ editors have gathered as the “greatest” shots of the year, and my shot of Jeremy Jones dropping what we tagged “the Nat Geo chute” during our recent Further Svalbard Arctic camping trip scored the spread as “Best Landscape” shot of 2011. I’d be happy enough if this was it all, but nay! The 25th anniversary issue lists my Deeper Alaska story from 2 winters ago amongst the ten most memorable features TWS have run in their 25 years as the world’s leading Snowboard title. Yes, of course I’m chuffed. So to help me celebrate this boost in ego, I’m launching here the Svalbard Chronicles… a varied and randomly ill-defined edit of my video-diary from the same 3-week Svalbard camping session back in May. if nothing else the video pieces may help you understand how, why and what the hell a mountain photographer’s life is all about. Be warned: there will be more.